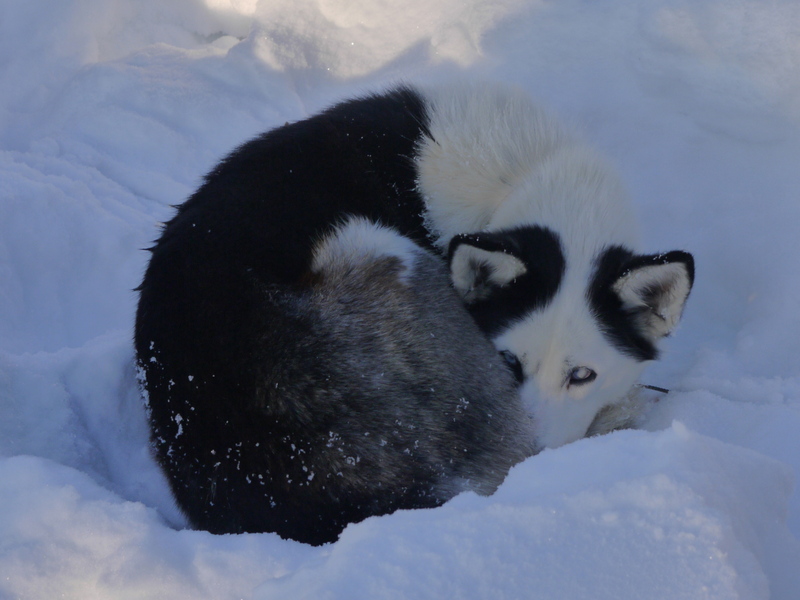 In previous posts I’ve told you about the Olesen family who hosted and guided us on our week of traveling by dog sled to the Barrenlands, and something about winter camping and the landscape we traveled through. In this post I want to tell you more about the dogs that made it all possible. 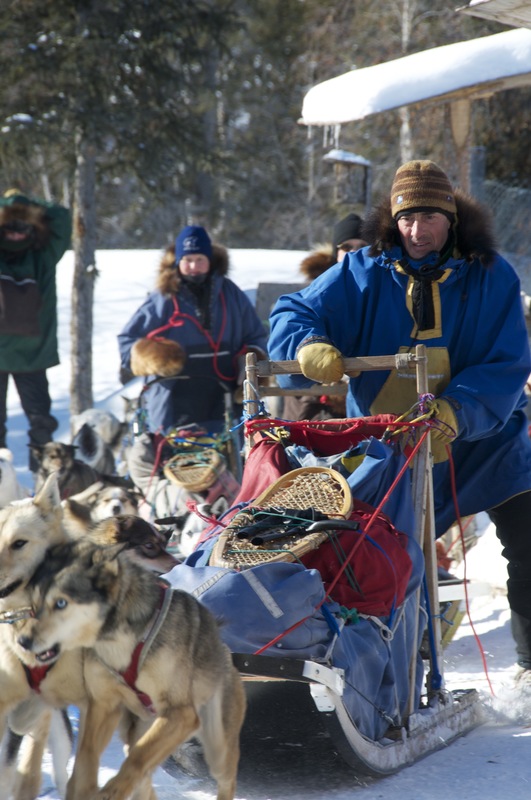 In my fairly short time observing the life and work of the average Alaskan husky sled dog, (a breed that arose from assorted northern dogs, dogs selected for their toughness, endurance and appetite for long distance running), its clear they are in a class by themselves when it comes to endurance abilities. Like human endurance athletes, they are lean and spare, bundles of muscle and sinew, and they look puny and undersized for their task. With surprisingly thin coats too – our golden retrievers, mostly indoor dogs, have 3 times the coat, (and 10 times the fat!). But what is really astonishing about them is how they absolutely live to run. 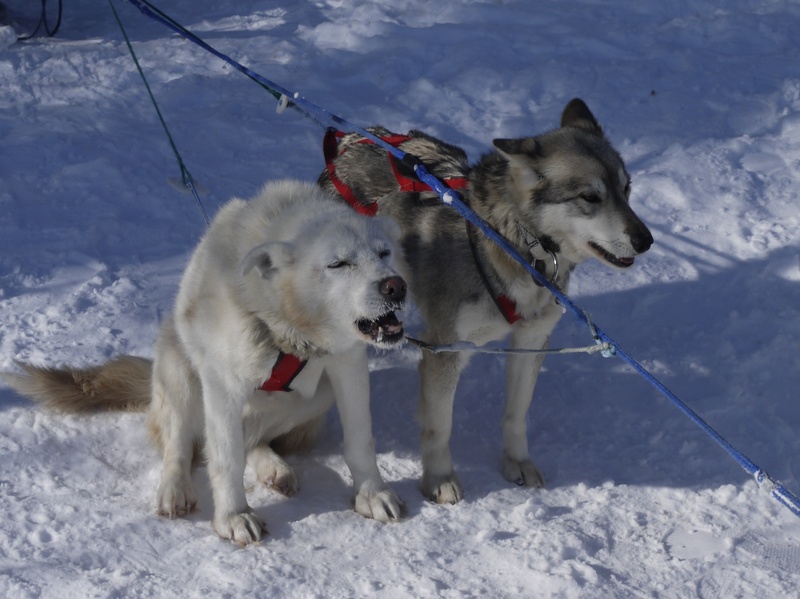 The moment they get hooked to the sled, they are barking and howling and tugging to be underway. Several hours later, when we might stop, even briefly, they immediately resume again – barking and howling and tugging to be underway again. I’ve never known a creature to be so called to do something as a husky is to run. They are the essence of heart and soul of running, distilled into dog. Even the geriatric old timers at the Hoarfrost, who are free to roam at will, take themselves off around the looped trail for daily runs. It was always a challenge getting started. If we were stopped on the trail, and didn’t pay full attention, or were just not firm enough, the dogs would head off at their own discretion. Each of the 4 of us had a time when our dogs left us in the dust, so to speak, and we were running down the trail fruitlessly trying to catch up. In my case as soon as I tried to pick up the snow hook, or turn the sled up from its side, they would be off. Eventually I mastered the task of lifting up the sled and jumping on the one runner that was on the ground, but that took a while. I love this photo of Martin setting out, as I think it captures something of the energy of it all. Once underway, the dogs were quiet. They would pull for all they were worth, constantly. As well, they had to be nimble when navigating the trails in the forest, occasionally jumping over the main gang line, or untangling a leg from it. 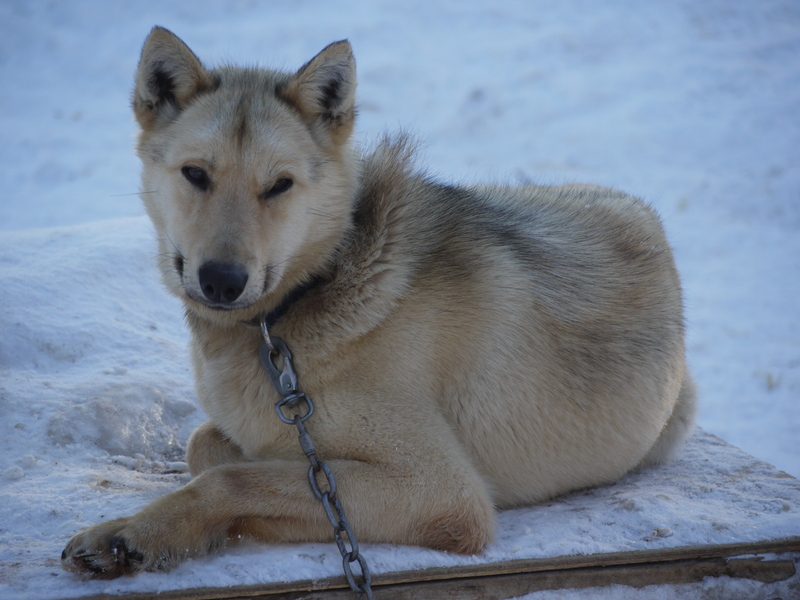 Once, when extricating a heavy sled that had fallen down hill into deep snow, one of the dogs was temporarily dragged, and she just immediately slipped out of her collar. Like I said, incredibly athletic, and smart. When we stopped for lunch, and unhooked them from the tug line, they knew it was time to rest and they would lay down and have a nap. But the minute it was time to go they were agitating to be off! 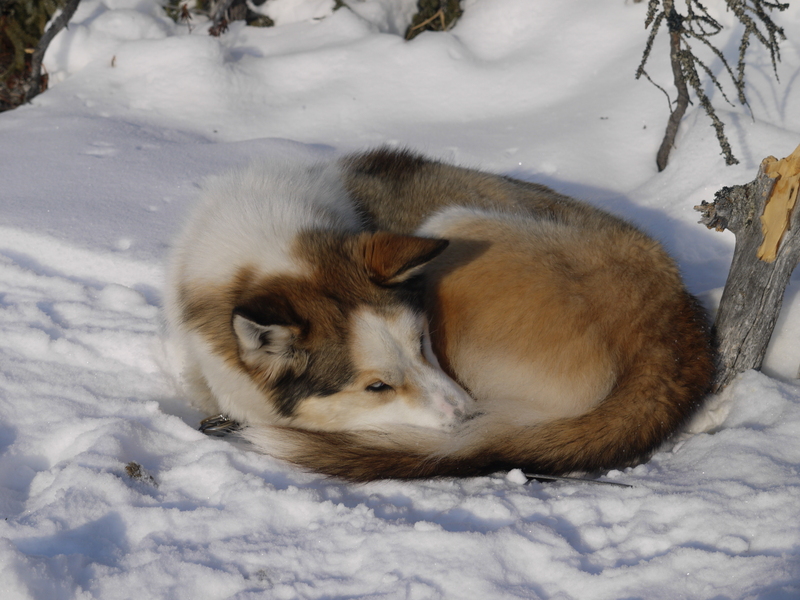 When we arrived at camp and they were staked out, they immediately curled up into the snow and went off to sleep. Imagine going for a 4 or 5 hour run, pulling your body weight the whole way, through soft snow, hard snow, open water (overflow) and ice, then curling up into the snow for the entire night, sleeping out in the open at – 40. And for fuel, two meals, with water mixed in, each day. It didn’t look like much fuel, or much food, but it was all they needed. They seemed to thrive on the whole experience, in fact Dave mentioned that on a previous trip earlier in the winter, when it was down to – 50 (!) the dogs had even put on weight on that trip. As I say, perfectly adapted to their role. 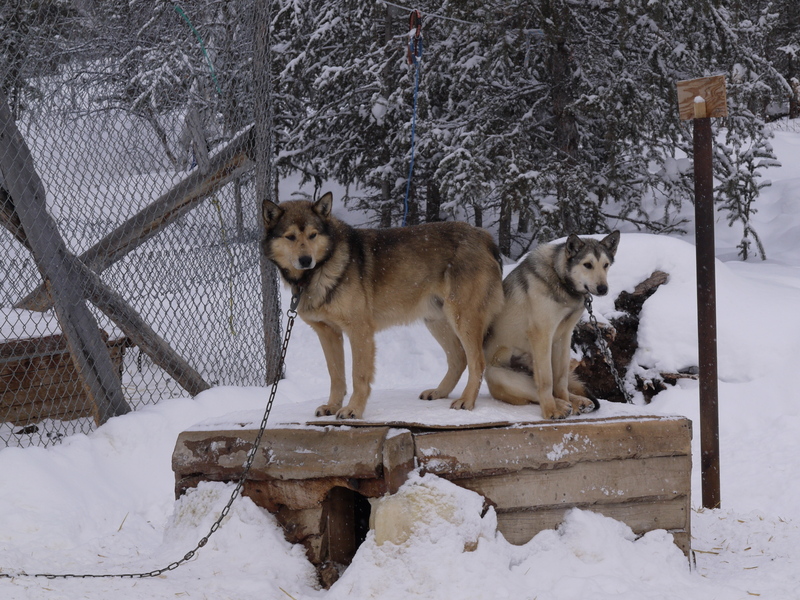 The Olesen dogs are very socialized, and very friendly. Some are shy, some are bold, some are in between. Some are smart and want to lead, and some want to follow. I loved getting to know them as individuals. The trick of course, is figuring out what each dog needs and wants. I fell in love with little Loki. At under 30 pounds, she didn’t know that she was small. She just loved to pull. She also loved to cuddle, and tell me stories. 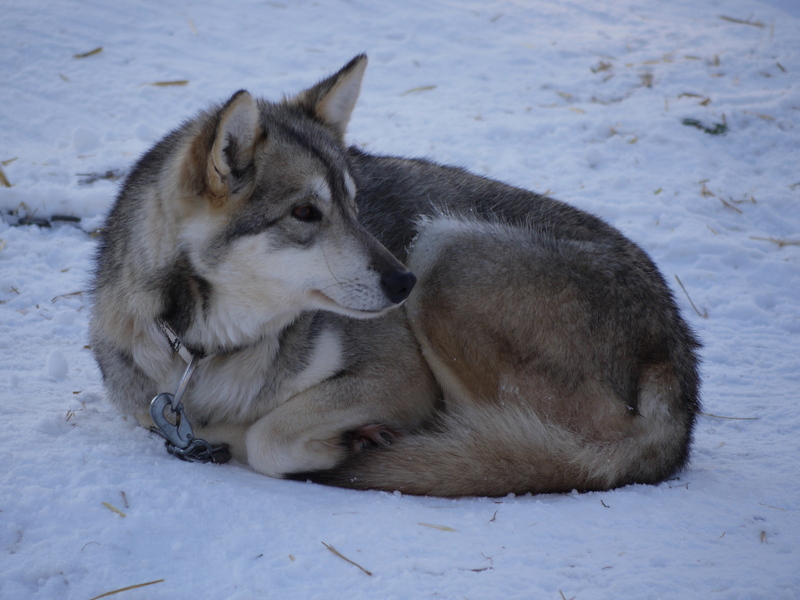 I could have brought her home in a second, but of course, her heart is at the Hoarfrost, where she can run and run. 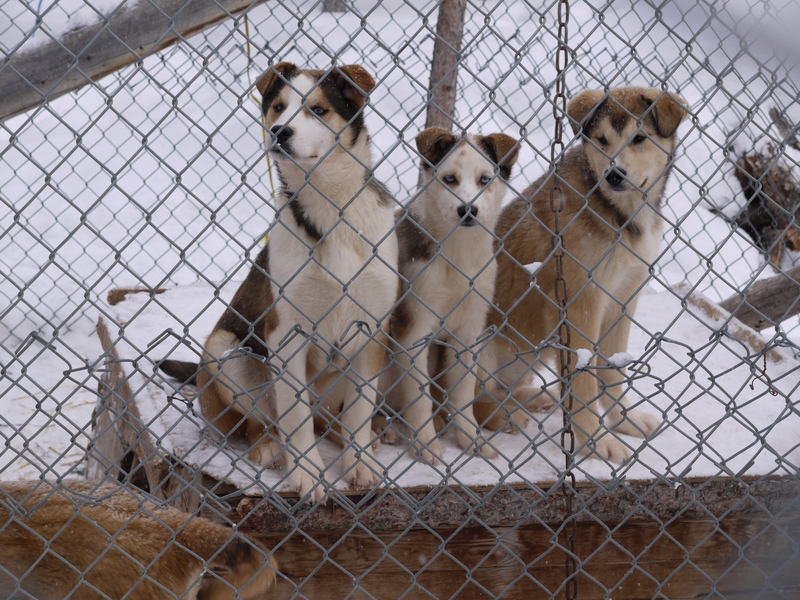 In the dog yard, each dog has its own house, and so gets to know its neighbours well. I loved to see how they were often close to each other, enjoying each others company. 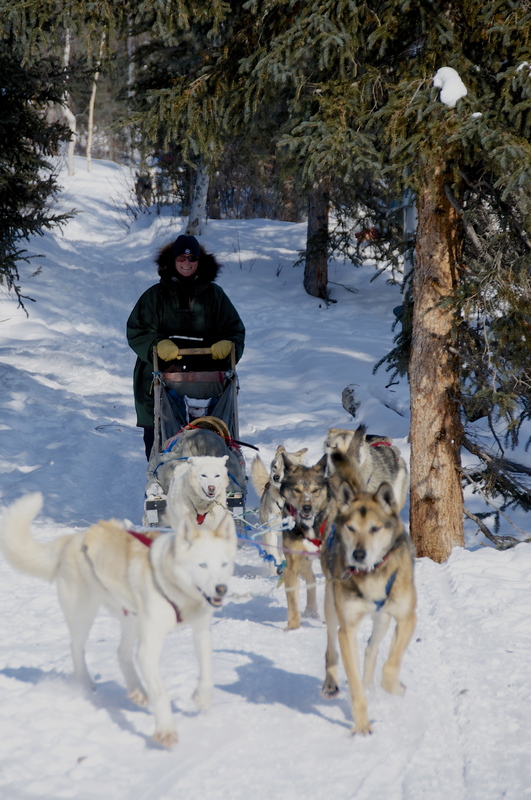 Here I am on the last run of the trip, coming back to the homestead. (Notice I am with my dog team – on the first day they arrived home without me, although I came huffing along a few minutes later!). Since we’ve been back home, I keep remembering this amazing experience, and wish I could go out again. Every day I imagine driving a team out onto the open lake for an hour or two of exploration and communion with the land. 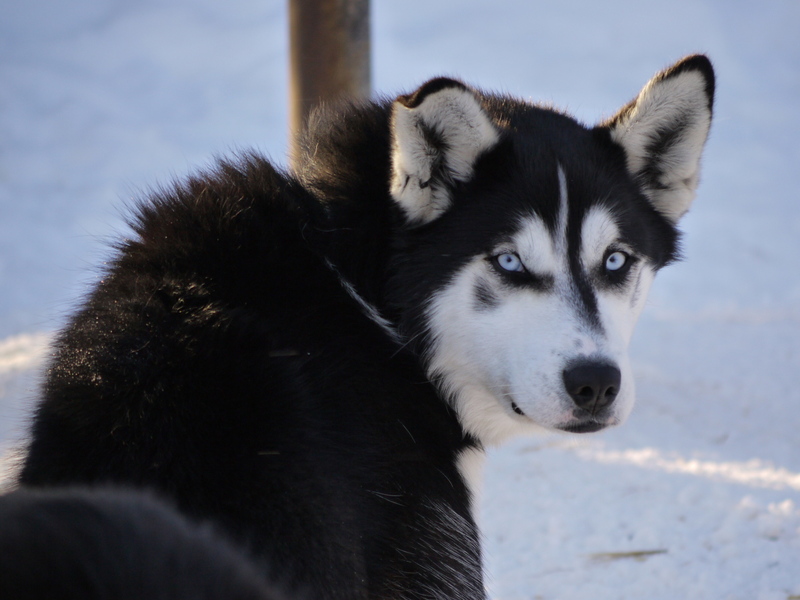 They’ve got under my skin, those Alaskan sled dogs. I can’t stop thinking of them. Who do we meet in our lives that are such pure distilled essence of being, so focused, so good at being who they are? They have many lessons to teach us. 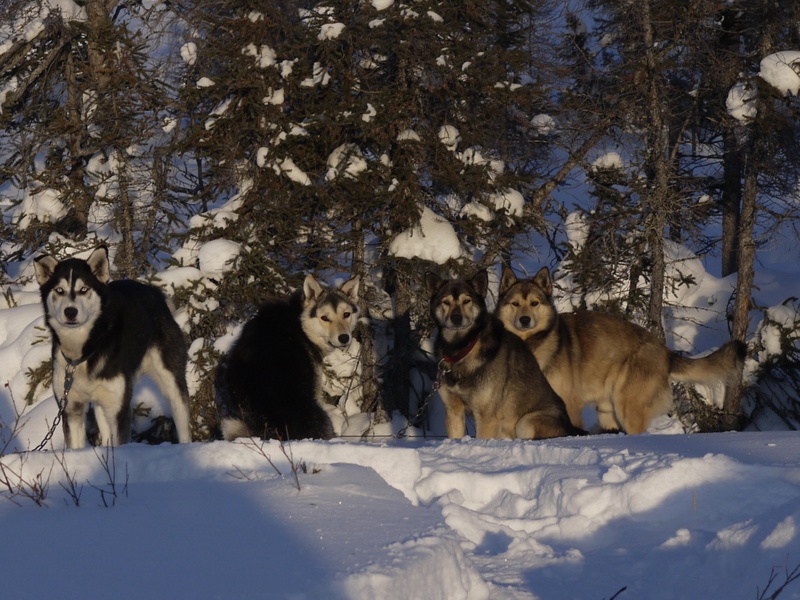 This entry was posted in North of 60, photos and tagged Alaskan Sled Dog, Dave Olesen, Dogsled trip, Hoarfrost River Huskies, Northwest Territories, sled dogs, travel, wilderness, winter camping. Bookmark the permalink. That is the biggest smile I’ve ever seen on your face! and to think, I questioned dog sled and vacation being in the same sentence. Yes indeed, love the dogs. I’m currently trying to control or at least ignore my desire for my own dog team. I know what a huge commitment that would be. I know that feeling; still some ways from being able to manage one or two dogs here, much less a team. Thanks for the link to Dave OIeson’s blog; I’d not come across it before. Thanks for commenting. That’s an interesting idea! It must be quite dilute explorer blood at this point. I can’t imagine being as tough as those early explorers were. What an amazing experience! Thank you so much for sharing. If you fell off, was it difficult to catch up? 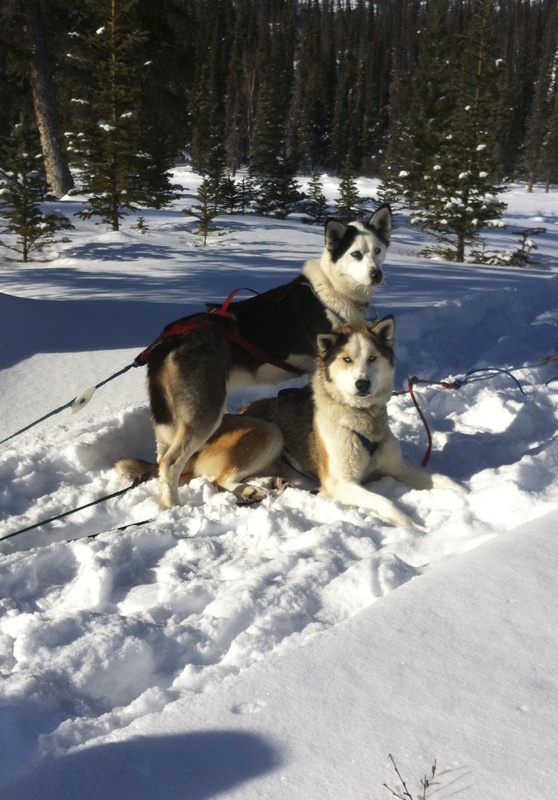 I can imagine struggling through the deep snow to get back to the sled! A once in a life time thrill. 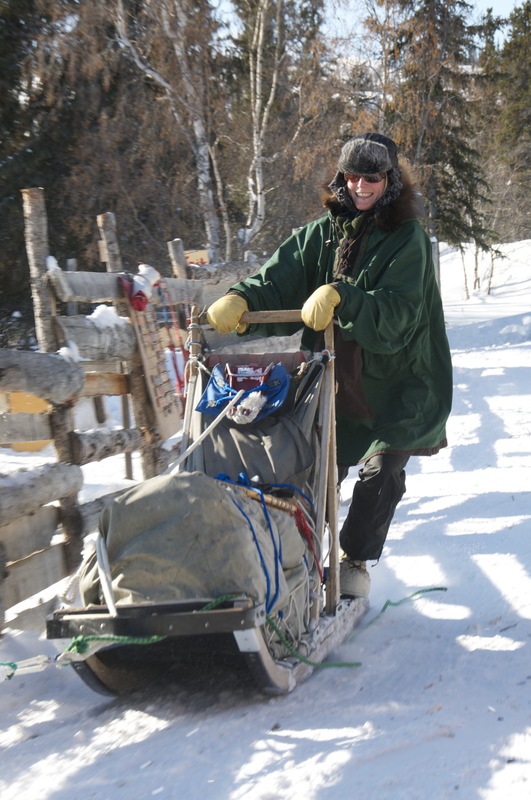 I had visions before the trip of running along beside the sled, for fun. I reality I has to hang on for dear life, and even get a bit dragged at times so as not to be left behind. There was no chance of catching up. The dogs were just too fast. And mostly, they didn’t want to wait for me. They would stop though if there was a sled in front of them, so then I could catch up. It was kind of fun figuring it all out. Wonderful I sent this on to my son in law who is a vet in Penticton . Thanks dear. I’m so glad you gave the dogs their own post. They’re wonderful — that first photo is spectacular. Their inner drive is a beautiful thing. Perhaps that’s a key to some of the artists and pure geniuses of the world. The focus, the effort, and the innate ability are paired with a sheer joy that makes the journey possible. The puppies are so cute. I can understand how the urge to have your own team would appeal! Love your posts and the super beautiful photos. This really looks marvelous Tandi, what a fantabulous experience! A trip of a life time for sure. You sure looked a pro on that last run home. Could not see the video footage (internet strength is not so good here) but the photos …. oh the photos! …. told the story for me. I’d give anything to have a Spring day in Yellowknife right now! !